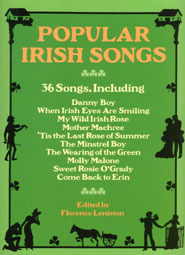 Original Sheet Music with lyrics for 36 songs of Irish origin or influence which were popular in America from the 1800's to today. Irish music has long been one of the great folk repertories of the world. Sheet music was loaned by the New York Public Library, the Library of Congress, the Free Library of Philadelphia, Sandy Marrone, and Larry Zimmerman.